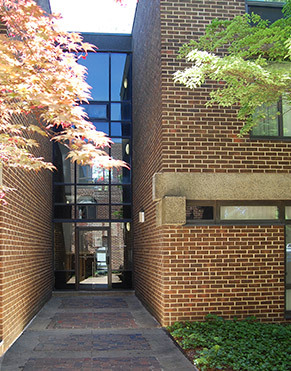 Goodman combined punched, arched openings in solid brick walls with rectangular and linear elements. He made extensive use of arches in the windows and balcony spandrel beams. Phase 1 fountain with stone surround was originally designed as a water feature, but later built to accommodate a tree in the center. 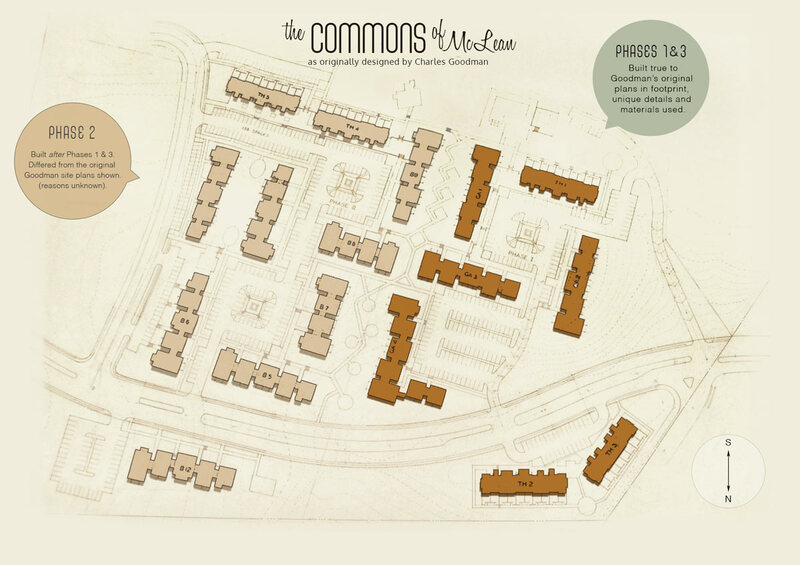 The Commons fit into the natural landscape, providing access to lush outdoor space. Entrances were downplayed by being recessed; they were enclosed by glass walls to provide light to the stairwells. 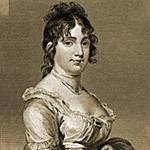 Goodman sited buildings in the existing landscape instead of the common practice of grading the lots flat and removing existing plantings before construction. Each townhouse unit has a rear, fenced yard that includes a concrete patio. Set at an obtuse angle to one another, Phase 3 includes two buildings that together contain 18 townhouse units. 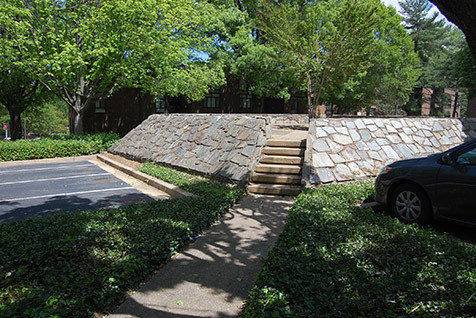 Concrete, stone & brick walkways and stairs were designed giving access to and between apartment buildings. 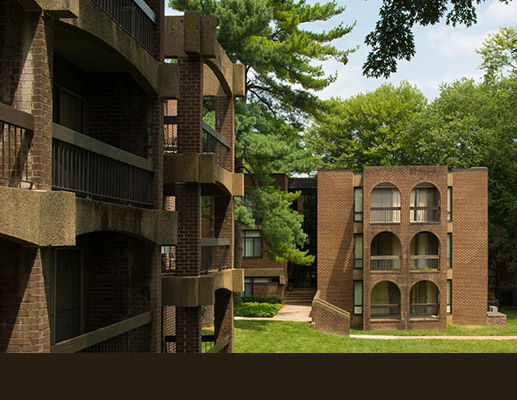 The Commons of McLean Garden Apartment complex occupies 38.6 acres in Tyson’s Corner, Fairfax County, Virginia. 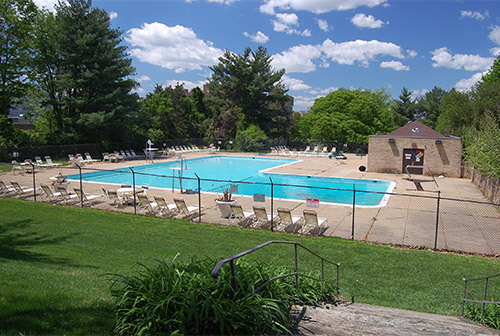 Located along Anderson Road between Chain Bridge Road (Route 123) and Magarity Road (Route 650), the complex contains 577 apartment rental units within 24 low-rise apartment buildings and 28 townhouse-style rental units. The buildings are sited in clusters across the property with substantial, landscaped, open space and mature trees scattered throughout. 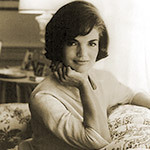 The complex was designed and built in five phases between 1965 and 1973. Phase 1 consists of garden apartments and townhouses, Phases 2 and 5 contain garden apartments; Phase 3 consists of 18 townhouse units; Phase 4 contains The Commons Shopping Village (the Goodman-designed shopping center was demolished and a new shopping center built in 2009; the Goodman-designed service station is extant). This report describes Phases 1, 2, and 3 of the development which were conceived and constructed between 1965 and 1969; Phase 1 and 3 were built simultaneously and Phase 2 was initiated two years later. 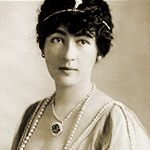 Phase 1, also referred to as the “First Cluster,” contains 117 apartment units and 10 rental townhouse units, and a swimming pool and associated bath house. 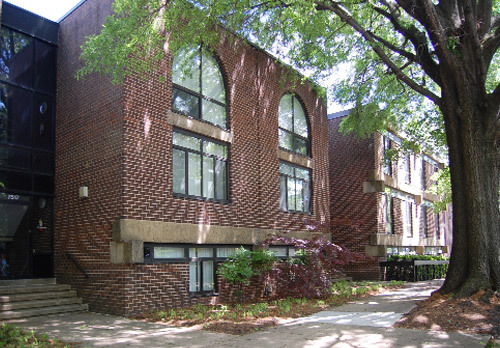 Largely constructed between 1965 and 1967, the cluster contains four, three-story, brick-clad, apartment buildings and one row of attached townhouses that includes 10 units. Set atop and spreading down a hill, the townhouses and apartment buildings are arranged around two connected squares. Each square contains a parking area that is accessed by Ambergate Place. All of the buildings are constructed of brick-clad cinder block and the site is heavily landscaped with numerous trees that screen the interior parking areas from the buildings that surround them. 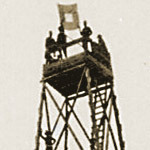 Phase 1 occupies the crest of a hill that slopes down gradually from south to north. The buildings are situated to enclose or partially enclose two paved parking areas, one at the upper or southern end and the other at a lower elevation near Anderson Road and at the property’s northeastern boundary. The parking lots and driveways are asphalt paved; brick and concrete sidewalks front the buildings. The upper parking area centers on a raised and landscaped square fountain feature with sloped, stone-clad retaining walls and concrete steps at each of its four corners. The perimeter of the upper parking area is planted with evenly spaced ornamental trees set within geometrically patterned brick and concrete walkways. A larger, open plaza exists at the southern corner of the upper parking area. The lower parking area is larger; it is divided by two, linear islands planted with ornamental trees. Its perimeter is planted with ornamental trees in a pattern similar to that of the upper parking area. Attenuated, black, metal light poles with square profiles are located at intervals along the walkways. 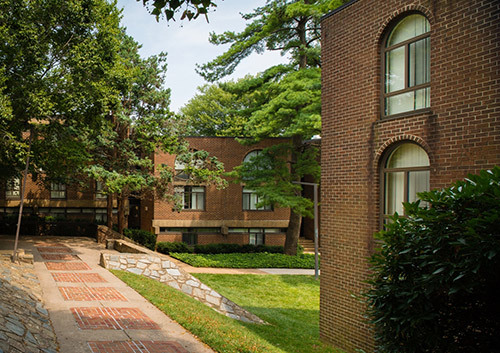 The garden apartment buildings that are included in this cluster or phase are all three stories in height and are composed of individual pavilions connected by recessed, glass-enclosed stair towers. Each pavilion has a separate address with individual units numbered within each. Buildings B-1, B-2, and B-3 are similar in design. Each is composed of five pavilions of graduated sizes. The elevations that face inward toward the central parking area are finished differently from the outward-facing elevations on the opposite side of each building. A distinctive feature of all of the apartment buildings are banks of balconies that extend across the elevations that face outward. 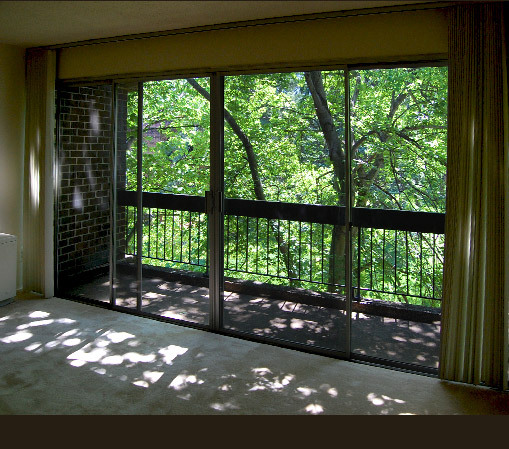 The balconies are distinguished by their shallow-arched, exposed-aggregate spandrels and extended beam ends. A single bank of balconies extends from the inward-facing end pavilions of Buildings B-1, B-2, and B-3. Third-story balconies throughout Phase 1 are uncovered. The inward-facing facades are characterized by a variety of window types; each pavilion has a distinct character based on the combination of window types. Some pavilions feature traditional, round-arched window openings, while others have only rectilinear windows and transoms that are combined to create grid-type patterns. A few of the pavilions combine both rectilinear and arched windows. Apartment Building B-4 is similarly composed of seven pavilions laid out in an L-shaped configuration set at the east corner of the lower parking area. The lower parking lot has a more standard parking lot layout without the centralized fountain feature. The block of ten townhouses (TH-1) stands along the southwest border of the upper parking area and faces inward toward the central fountain. Each townhouse unit opens onto a paved terrace with a combination of patterned brick and concrete paving that extends across the front of the townhouse block. The townhouses are two and three stories in height. Each unit has a rear patio enclosed by brick-clad walls. TH-1 occupies a sloping site where the units step down toward the northwest. 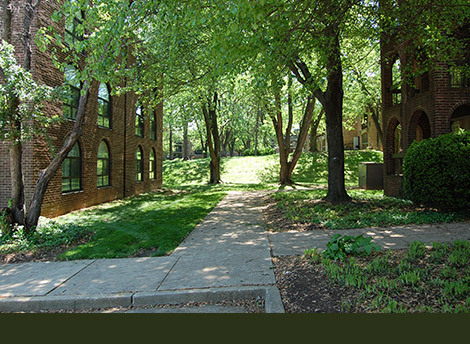 The grassy area behind the townhouses forms a series of terraces. 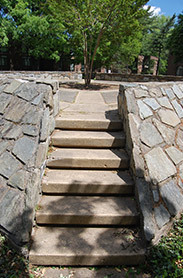 A walkway with a series of stairs built into the terraces extends down the slope at the rear of the townhouses. The ten townhouse units utilize the same varied vocabulary of arched and rectilinear windows as the apartment buildings. A new element in the townhouses is the round-edged, rectangular arches utilized in the lintels above some of the entrances. Each of these entrances contains a single-leaf, flush metal door with a round-edged transom and a single, full-light sidelight. Another unique feature of the TH-1 building is the use of deeply projecting segments that enhance privacy. Some of these projections incorporate unit entrances that face laterally instead of facing out toward the central parking area. Phase 2 contains 186 units in five, three-story, brick-clad apartment buildings with addresses on Anderson Road and Colshire Drive. Two different building designs are present: two of the five buildings are long (Type A) and three are shorter buildings (Type B). One long and two short buildings are arranged orthogonally in a U-shape creating a rectangular central courtyard that is open on its northwest end, facing Phase 1 of The Commons. The other two buildings, one long and one short are situated along the southwestern and northeastern boundaries of the Phase 2 parcel. The second long building stands parallel to the property’s southwest boundary and is fronted by an asphalt-paved parking area. The one additional short building stands across Anderson Road, to the east of the central, U-shaped cluster; it faces Anderson Road. Phase 2 stands on a slightly sloping parcel. 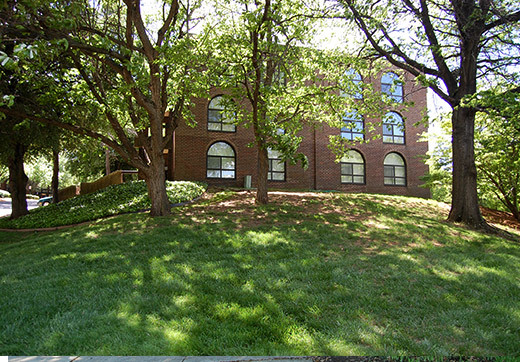 The central courtyard is relatively level, grassy, and planted with scattered mature deciduous and coniferous trees. There are no paved paths within the central courtyard. A U-shaped, asphalt-paved parking lot extends around the outside of the central building cluster. Concrete walkways provide access to and between the apartment buildings. Mature trees front some of the buildings and line Anderson Road. A row of medium-sized trees grows in a median strip that divides the parking lot located to the west of the central building cluster. Completed in 1969, Phase 2 of The Commons was built after Phases 1 and 3. Although it contains garden apartments like Phase 1, the massing and architectural vocabulary evident in the earlier phases was simplified in the design of Phase 2. 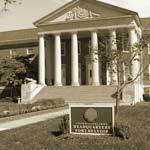 The buildings are three stories tall and are constructed of cinder block clad with brick. Like Phase 1, they utilize precast, exposed aggregate concrete for details, including on the lintels and balcony spandrels. Phase 2 departs from Phase 1 in its simplified massing and uniform use of arched window openings. Each building is divided into several units that are connected by enclosed staircases; the sense of each of these units being a separate pavilion is diminished by shallow setbacks and generally uniform sizes. Variety is achieved with setbacks, slight grade changes, and staggering of window heights. The outward-facing facades of the buildings read as a series of projecting bays on varying planes. Each stair entrance is denoted by an aluminum storefront with a full-light, single-leaf door capped by a two-story-tall, metal-clad, steeply sloped shed roof that encloses the stairs behind it. 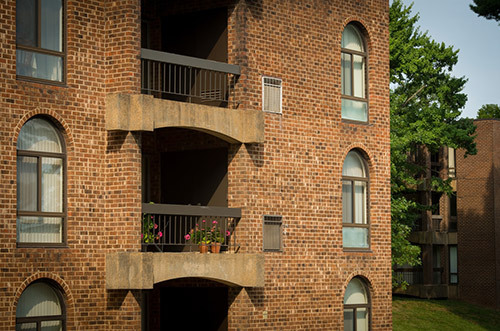 The rear elevations of the buildings (the elevations that face inward to the central courtyard or outward from Anderson Road and the western parking area) feature inset balconies at each floor level. The balconies are spanned by precast, exposed aggregate concrete beams similar to those used in Phase 1. Shallow wing walls project from the face of the buildings and enclose each balcony. Unlike those in Phase 1, the third floor balconies are roofed. Type A and Type B buildings differ only in the number of units and length. The type A buildings have six entrances; a central tunnel entrance provides access to service and storage areas in the basements. In the case of the central building cluster, the tunnel connects the parking lot side of the building to the courtyard. Type B buildings have four entrances. 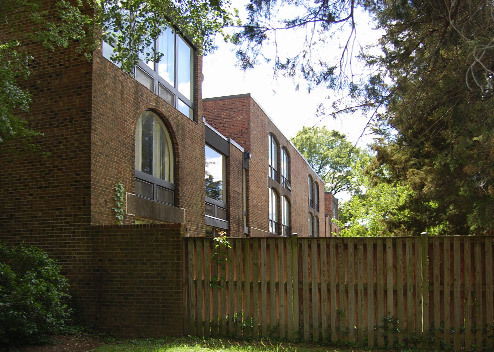 Completed in 1967, Phase 3 includes two buildings that together contain 18 townhouse units. Building TH-2 contains ten units; TH-3 is a row of eight units. The site also includes concrete walkways and two parking areas. Set at an obtuse angle to one another, the two buildings face Anderson Road and a front parking area. Landscaping is minimal, consisting mainly of mature trees lining the street front, scattered shrubs, and foundation plantings. Building TH-2 has the same footprint as TH-1 in Phase 1 of The Commons, and the units appear to be very similar in exterior design. Like Phase 1, some units are two stories and some are three, though they all appear to be two stories from the front or street side. The façade treatments also are very similar, utilizing arched windows sparingly and rectangular windows more frequently. Large, uninterrupted expanses of brick wall provide both privacy and a sense of solidity. Building TH-3 has a very similar layout to TH-1 and TH-2, but it encompasses only eight townhouse units. Both Phase 3 buildings have straight rear walls with no projections. 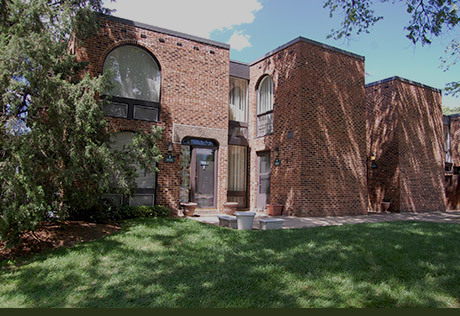 Each townhouse unit has a rear, fenced yard that includes a concrete patio.